This last week has been a series of ups and downs, going to see houses, thinking that maybe we liked them but on second thought No, No We Do Not. I got excited over one particular house on Brasstown, but James did not like the idea of doing that much work, even though that was what I liked so much about it. Putting our own stamp on the place, you know? But we’re putting in an offer today. Right now, actually. I’m jumping between eating brunch, writing this, and reading the important legal document that I’m sure James will be quizzing me on later. So this is the house we chose! Isn’t it lovely? The stone isn’t real. But it looks really good! The front porch is really only big enough for a potted plant and a rocking chair. But the back porch is a decent size, big enough for a porch swing and a grill and some patio furniture. I definitely plan on adding some trees to that yard. But it’s big enough for croquet, which is the most important thing of all. 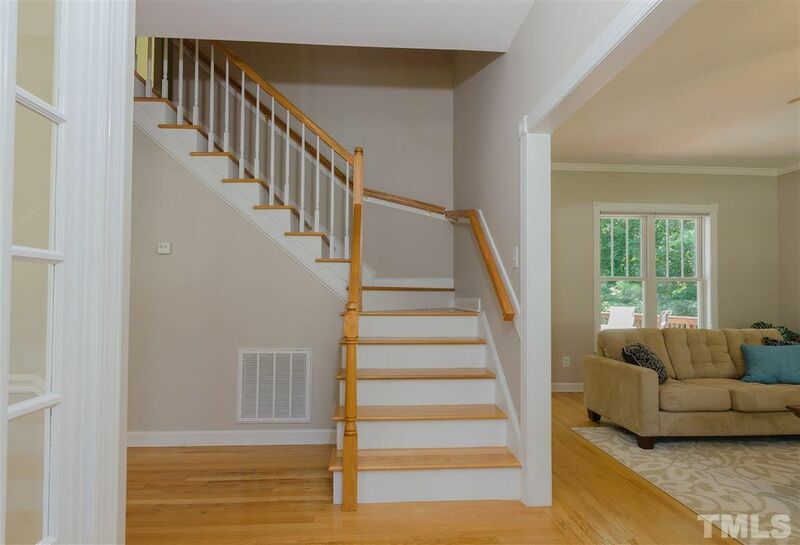 I WAS going to go into detail here about the foyer and my plans for it, but there are no good pictures of that foyer on Zillow. So that will have to wait until I can take my own. This picture is not sufficient. The house is crazy cool. I talked James into letting me switch out that laminate for a hardwood that’s more my style though. It would cost around $4000, but I could get a hardwood that match that railing. It would look a lot better overall — better flow from downstairs to upstairs, better maintenance, longer-lasting floor, and it wouldn’t be that slightly red color. I hate red floors. I hate them. Otherwise I’ve been imagining what I’m going to do with my study. Ever since I moved to NC I haven’t really had a space to call my own. It’s not enough to say that this is our space. If I want to do any sort of work I have to take over the kitchen table or a corner of the bedroom or part of the kitchen. It’s been frustrating and honestly I’ve complained to James a couple times that I felt more like I was living in his house, with his furniture, than like this was a shared house. But this room? This room is mine. 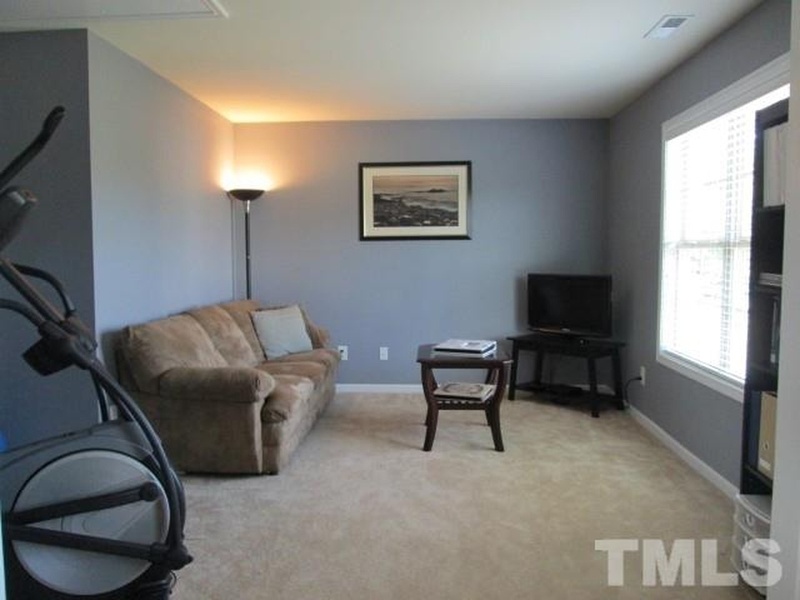 It’s literally sitting area right off of the master bedroom. It’s big, the size of a small bedroom, rather than just a little corner of another room. Which is where I want my office to be. I want to stay up and do word puzzles or read until I get tired, and then crawl into bed a few steps away. I haven’t really been able to expand on my own personal style, but in the few opportunities I’ve had I’ve always had a bold reddish-purple theme. I might go with a nice blush this time though. I’ve been hanging out on Pinterest and I’ve seen some rooms with nice blush walls or furniture, complemented with silvery metal accents. Which is what I have. These gorgeous pictures frames that Donna gave me as an engagement gift, and some presents that I’ve gotten from my family over the years (also mostly picture frames). I would love to start actually displaying my collection of pictures of people taking pictures. Otherwise I think I just want family photos and a few personal touches. 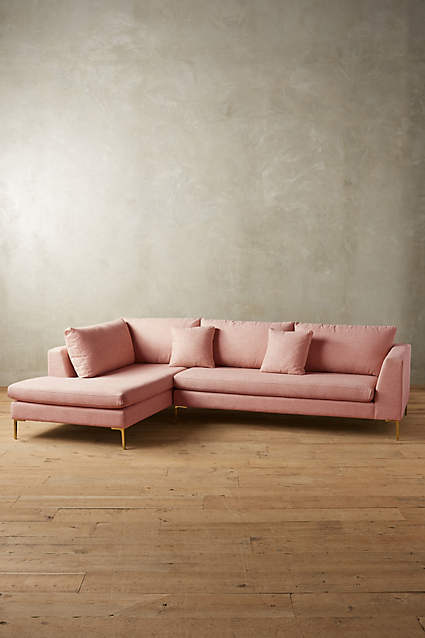 Furniture-wise, I would want a couch with a chaise lounge at one end. I have a desk, but it’s tiny and cramped. I might give that up to have just a work table and a big shelf taking up one wall, full of my history books and other stuff. That’s actually the style right now — big, open shelves with mixed-use items. And I would want a lapdesk. So I could do word puzzles more easily. Oh my god. The only way this room would get more trendy is if I built the shelves out of reclaimed wood. We have now gone house-hunting with our real estate agent three times. Wait. I have. 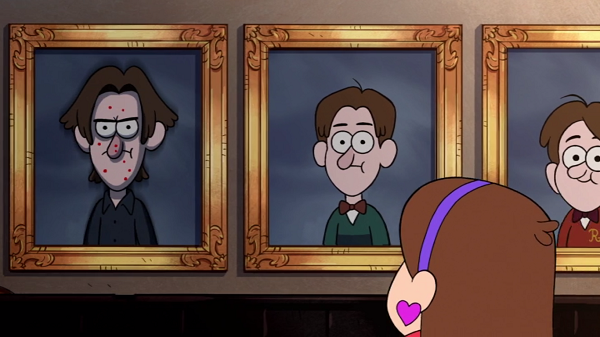 Unfortunately, James had to sit the most recent one out. Last week I emailed our agent with four addresses and said “Hey can we look at these houses?” I chose them because they were a) sitting in our Favorites list and had been for some time and b) all clustered in a relatively small space on my map. So she took us to each of these house last Tuesday. We were excited. I had chosen them all by myself, and maybe soon we would be living in them! James was equally excited, because what if we found The House today? As it turns out, she was actually there to take us on an educational tour of what to look for when shopping for a house. Those houses had been sitting on my Favorites list for two weeks? Well, why hadn’t they sold in two weeks? James and I were left stunned. The next house had okay floors, but the layout was much weirder than what we expected from online; the laundry room had been moved around, all the entertaining space was in the basement, and no updates had been made to the house ever. It was for sale by a real estate broker. “Want to see what a real estate agent’s office looks like?” our agent asked me. I peeked into the office. It looked like a generic messy office. The next house? Well, the next house had an awesome loft, which James and I raved over. It sat a half-flight above the kitchen, away from the formal areas downstairs but still close to the kitchen and the front door. Another half-flight up the stairs took you to the bedrooms. The floors were in terrible shape, sloping, and the windows were starting to go, and there was a weird crack in the basement, but worst of all was the terrible noise. I also pointed out that having the dining room right next to the breakfast nook was really cool. If you hosted a whole bunch of people, they could still be near each other even if they were at different tables. The next house had the worst situation of all. It sat on a slab, and had carpet and vinyl everywhere. It was a former rental property, and the tenants had torn up the carpet, or at least their animal had. There were holes and burns in the carpet, and obvious signs of either throw-up or poop. The paint job had been hastily done. There was moisture damage to the front door and the front window. They had added doors to the attic to make more room for storage, which may or may not be legal. The kitchen still had appliances from the mid 90s. The house was listed at $379,000. But the layout was everything we had hoped for, the location was great, and there was a great backyard. Would we be willing to spend, say, $300,000 on it? Buy it as a fixer-upper? Our real estate agent said she could look into it but wasn’t sure. She took us to another few houses a few days later. The first one was right down the road from our current rental. We liked the updated kitchen and it had a very nice loft, since we had clearly reacted so strongly to the loft earlier. It also had a screened-in porch, although that may or may not be legal, and an awesome backyard. And a fake deer, with bullet holes in it. And a hunting rifle, sitting out in the open. We liked it pretty darn okay, although we wanted to be a little farther south. Turns out she was still just testing the waters to see what we liked. She took us a little further into the neighborhood and showed us a house $50,000 cheaper. It was still a detached home, but all the levels were stacked like a townhouse. There was no entry area. You could either walk into the living room, or go up the stairs. No lingering, you were blocking the door. The kitchen sat partially into the dining room. The bedrooms were small. There was hardly any yard, and the space between houses was barely wide enough to fit your car into. James and I couldn’t get out of the house fast enough. So she took us to a house that was a lot like our favorite house from earlier. 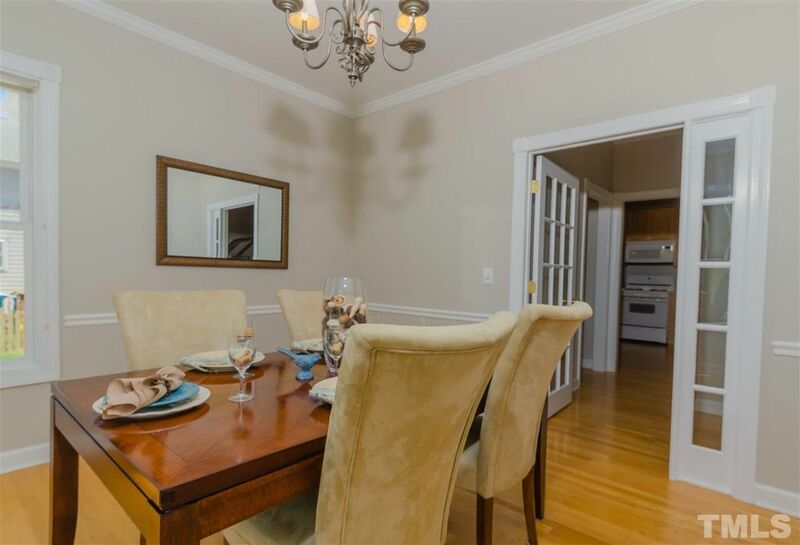 It had a nice foyer that lead either into the formal dining room or off into the living room. The kitchen overlooked the living room. And halfway up the stairs was that same awesome loft. And then up the rest of the stairs? A little office area right off of the master bedroom. But the house backed up to a creeks, so it had a severe slope. There was basically no yard. But the location was terrible and so James and I decided not to consider that location at least. Perhaps if the location was right, we would do new construction. So we continued the hunt, and we found a few more houses to like. She emailed us early this morning to say that one of the houses we liked was doing an open house this evening. James is closing his work, but I could definitely make it to the showing. Since I had spent part of my lunch hour arranging for some pre-mortgage stuff, I said that yes, and hadn’t she gotten the email? I honestly hadn’t even been thinking about it, but now that she said it I felt rather nervous about the whole thing. And so we entered. I hadn’t realized how nice it had been walking into a house just the agent, James, and I. There were three other families wandering around, with their agents. It was hard to get a sense of how to use the space because you felt embarrassed to bump into other people. But when there weren’t other people in the room, I felt okay to wander around and think about things. The kitchen was gorgeous. “This is exactly James’ style,” said our agent, and I had to agree. The backyard was smaller than I thought it would be, although it was surrounded by trees. And I could hear the road. I went back upstairs to the master bedroom and decided that no, we couldn’t hear the road from inside, but still, standing outside, you could hear the road. It wasn’t a highway, but it was still a main road. It hit all the things we wanted. A nice, working kitchen. Recent updates. A bonus room. A screened-in porch. A good location. And yet I couldn’t get excited about it. Logically, I should feel excited, right? That was a very nice kitchen and an awesome screened-in porch. James texted me to ask if I had seen the house. I replied yes. He said he was going to take a lunch and would call me ASAP. I met our agent outside. She started to ask me what I thought, when my phone interrupted. We took the conversation to the car, since there were people around. So? What did I think of the house? 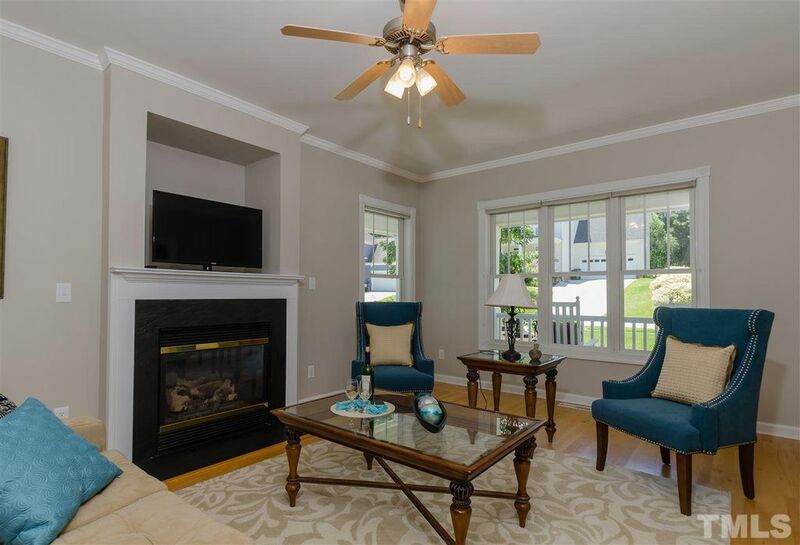 I described the kitchen and how nice the dining room was and the windows of the breakfast nook and the screened-in porch and a bonus room and don’t worry, the master bedroom faces West, and there was a side-entry garage, which is all the things we want. “So you liked it?” said James. I couldn’t say yes. And I couldn’t say no. The question hung in the air. The real estate was watching me. She prodded us along, trying to get us to talk about this. “What questions do you have, James?” she asked. James wanted to know why, if the house was so great, it was being put on the market at $300,000. Probably because the seller wanted multiple offers, to get as much cash as possible and to sell the house quickly. We would have to put forth a strong bid if we wanted it — something more like $350,000. “Three hundred and fifty?” James echoed. But we could do it…if we liked it. That was the $64,000 question. It all fell on me. There was no time to see if James liked the house. He trusted my judgement completely. If I liked the house, we would go all in. James and the agent agreed, but it was no time for laughing. It was dead serious. Did I or did I not like the house? It was a great kitchen and I really did like that side-entry garage. 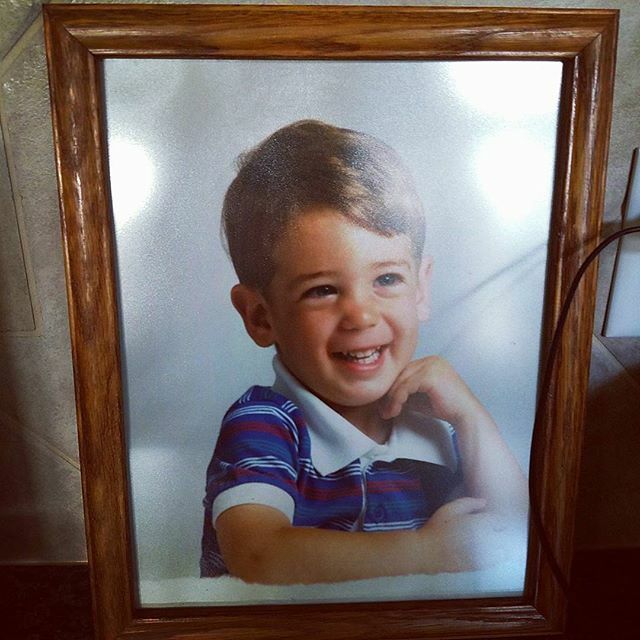 But did I like the house? I stared at the house. “So you don’t want it,” said James. And that was that. Saying it out loud was hard, but once it was out, I felt confident. It was completely, 100% true. I did not want that house. It was not our house. It was not the yard I wanted. It was not the living room I wanted. Saying no to that house was probably the most grown-up thing I have ever done in my entire life. I felt like a ghost for a while afterwards. I didn’t feel like me. Everything felt different. Even when I drove home. Even when I played games on my phone. Even when I fed the cat. It was different. Because I did the right thing. 2) Sorting all the houses on the the real estate agent’s Client Site into Favorite, Possible, and Reject houses. Nice big windows, lots of light, family area separated from the living area, and a good location. In fact, I’m pretty certain one of my bosses recommended this neighborhood to me? There’s no pictures, but they also list a “nice big flat yard” as a bonus as well. I was actually really surprised how often #4 came up. I suppose that makes sense. 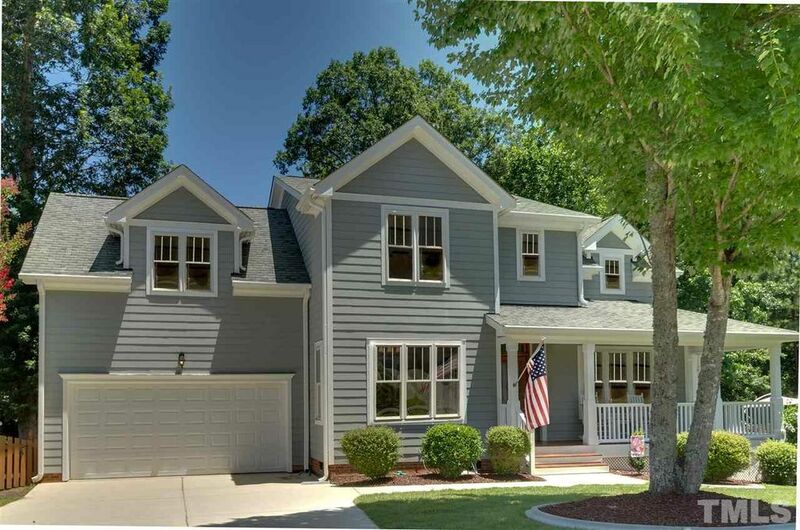 Our budget can get you a reasonable 3-4 bedroom house in Cary or Apex, but it can get you a lot, a lot, in Durham or Holly Springs. I was regularly looking at houses with 5 bedrooms AND an office AND a bonus room AND a game room. We don’t need that much space. I’ll take fifth bedroom or a bonus room, but not both. We’d have to heat or cool those extra rooms. We’d have to vacuum or sweep those rooms. We’d have to decorate those rooms. What would we do with them? There’s only two of us. We might be planning on expanding our family someday, but we’re not rabbits. We can only spawn one, maybe two extra humans at a time. On the plus side, given the historical record, those extra humans will be exceedingly adorable. There’s a variety of reasons that I would put a house in the Reject list. For instance: if it was in Holly Springs. 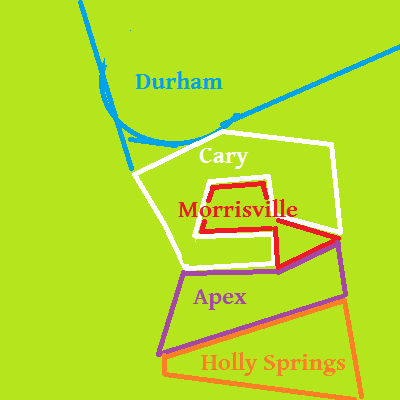 Here is my extremely rough map of the Raleigh-Durham area. I just realized I forgot to label Raleigh. It’s to the right of Cary (or East of Cary, I guess). There’s no real scale, but it’s about a 40 minute drive from South Durham to Holly Springs. That’s not even in traffic. That’s just regular, smooth highway going. Another house had an above-ground pool that took up most of its backyard (that house appears to have sold, so I can’t grab any pictures). My goodness, look at all the layers on the outside of this house. This house is dynamic and interesting to look at. It has a screened-in porch, which is a joy I hadn’t discovered until I moved to North Carolina. You sit outside, but with all the protections of the inside! 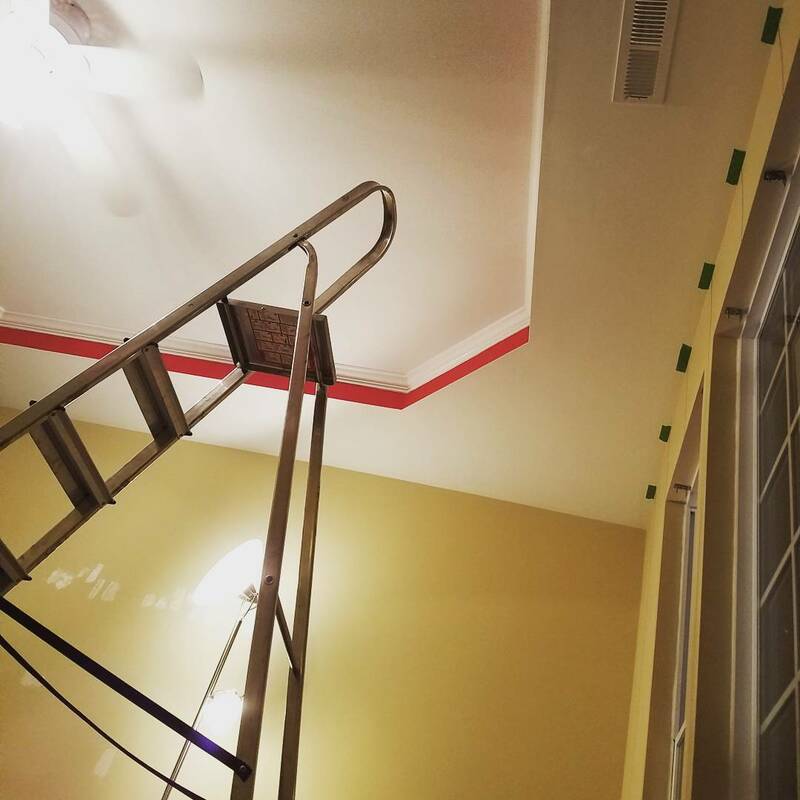 No bugs, and you get a ceiling! That coffered ceiling! Those built-in bookshelves! The ceiling fan that doesn’t have a light on it! This flex room in the front — look at those french doors, that glass over the doorway, the easy access to the kitchen. A second-floor laundry room! Interesting ceilings throughout! Everything looked fresh and clean and there were chair rails everywhere. Small details, like the painted doors and railings, that popped and made this place look so fresh and neat. I was in love. I immediately Favorited it with the note THIS IS MY DREAM HOUSE. This was how I learned that my real estate agent was, in fact, reading the comments that I wrote on every house. She emailed me about the house twenty minutes after I saved it, warning me that I needed to move fast, since this house was not going to stay on the market very long. Had I contacted my bank or her in-house lender? I sent the house to James. He told me to check out the open house, which was coincidentally on my day off (fate, right?). I told him I would. I showed a picture of the house to all my fellow Home Depot employees. “That’s a very nice house,” they all said. I went to bed dreaming of that house. The next morning I reconsidered. Not my ardor, I couldn’t reconsider that, but I had to reconsider my new dream of living in that house. I hadn’t gotten in touch with any mortgage lenders. The first opportunity that I would have for that would be during my lunch hour on Monday. Who knew how long that process took? And I completely, 100% believed my real estate agent when she said that the house would move fast. The house was darling. We don’t have unusual tastes. We don’t want to live anywhere strange or out of the way. We don’t have strange demands from our house. I had to say goodbye to this house as soon as I had found it. I went to the open house anyway. I needed to see what an open house was like; I’ve only ever visited them as a non-buyer, a tagalong for someone else buying a house or just for funsies. My typical impression was that all the potential houses had too much white. How would I feel in this house? I was nervous as I approached the house. The neighborhood was well-established. There were lots of trees. No sidewalks, but lots of people walking along the sides of the street. There were also a lot of hills. The darling house sat near the top of one of them. The door opened before I even got to the porch. I looked quickly up and down the porch. It was actually somewhat thinner than I imagined. If I put a couch swing on it, it would have to face the street, rather than the rest of the porch. The man who answered was the real estate agent, who was happy to see me. He welcomed me in and asked me about my house hunting and who my real estate agent was and what I was looking for in a house. He also talked up the house. To be fair, it wasn’t a stretch. The house was gorgeous in person. The built-ins were perfectly balanced. He noted all the attention to detail — the clapboard behind the TV, the coffered ceilings, the careful adherence to a beachy aesthetic. Every single part of the house had been upgraded, he told me. The current owner was a current general contractor, and spared no expense in his own house. The kitchen was white, but the pantry was deep, the quartz countertop was smooth, the faucet was tall. The outlets were in sensible places. I opened and closed a few doors and drawers. They were soft-shut — they rolled normally for most of the way, then stop and roll slowly into place for the last bit. Prevents jamming your fingers when you’re shutting doors and drawers. Soft shut cabinets, and I wouldn’t have to pay for their installation. Glorious. There was a hall closet, placed halfway between the garage entrance and the main entrance. It was a deep closet, too, since it was under the stairs. The built-ins included little window seats that doubled as storage. There was only one hang-out room, the living/family room area, but was that really the end of the world? Really? I hadn’t realized that the backyard was sloped when I was looking at pictures, but looking around at it, I thought that the slope wasn’t that severe at all. I had played croquet on worse hills. A good chunk of the backyard was even flat. Upstairs, the master bedroom was cool. You walked in and took two steps down to get into the room. The room was big enough for our bedroom furniture, and had a nice big closet with upgraded shelving. The bathroom had shockingly a low vanity (that would have to be changed) but there were two sinks. And the fact that you had to walk back up two steps to get to the toilet and the shower was cool. There were three other bedrooms besides; two regular bedrooms and a bonus room, which was set up as a bedroom but felt more like our future office space. And lots of surprise storage, hidden shelving in the closets and extra shelving tucked into corners you couldn’t see from the doors. It was all very clean and organized and done. I loved it. We needed to paint the walls a different color — nothing wrong with the current colors but James and I aren’t beachy people — and the vanities needed to be taller, but other than that, the house was perfect, utterly perfect, utterly darling. I chit-chatted with the real estate agent while we waited for James. He was friendly and from the neighborhood, the father of two teenagers. We talked home decor and about splitting chores between spouses. It didn’t feel awkward at all. He was either a very nice, chatty guy or a consummate salesman, able to make you feel comfortable. Or both. I felt comfortable in that living room, even though the couch I was sitting on wasn’t my couch and the TV in front of me wasn’t my TV. I don’t know if that’s true, as I’m going to start doing research on that after I finish this blog entry. But that was the tact he took with selling the house to us. He didn’t have to talk us into the house. James also recognized that not having separate living and family rooms was okay, since the rest of the house was great. And we were really close to friends, and in the right area that we wanted. What the real estate agent had to do was try to talk us into making an offer. Making the next step. Saying more than we want this house and actually putting our money where our mouths were. But neither James nor I believed him when he said we could get that paperwork done in an hour and a half. And James and I both accepted that we would not get this house. Down the road. The real estate agent said that the woman who owned the house had several dogs and cats and had put her money into that instead. The house didn’t have these upgrades. It had been on the market for two weeks, twice as long as this darling house had been. But it had the same layout, was in the same neighborhood, and was $11,000 less expensive. I don’t know if James was convinced or not. But we drove a little bit up the road and looked. The inside wasn’t open for looking, but we could peek over the fence at least. It looked, on the outside, much the same. I’ve gone on Zillow since then to look at the inside. The darling house’s picture showed the view from that corner into the kitchen. This is the view from the kitchen into the living room. 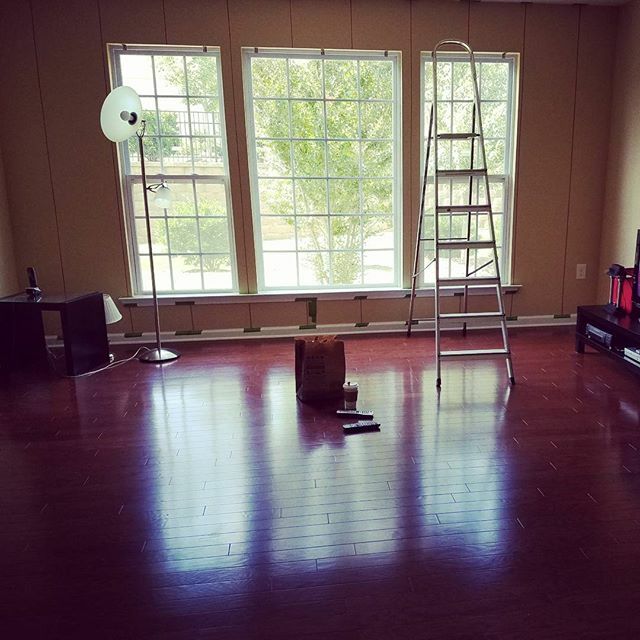 It’s certainly a nice-sized living room, the same size as the other living room, and clearly it has the same real hardwood floors. The kitchen still has laminate countertops, ugh. 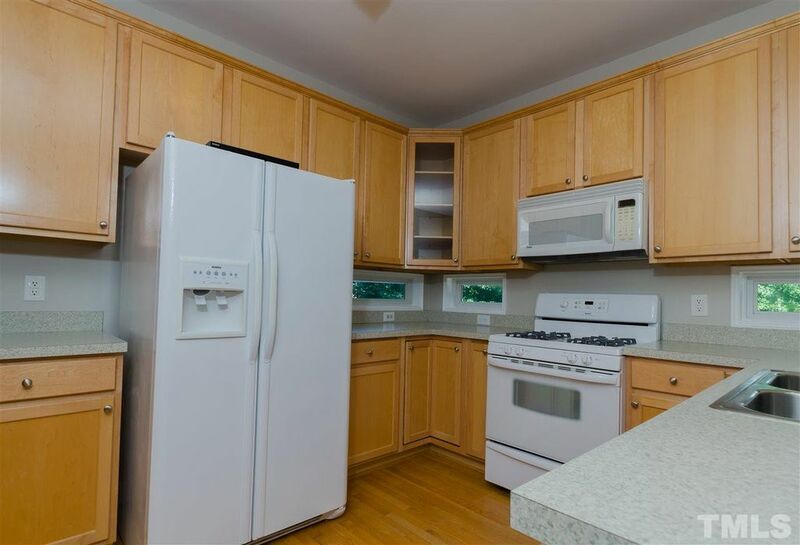 And the fridge is sitting in the middle of the counters, rather than off to the side where it’s more convenient. But there’s outlets everywhere, great for using small appliances. And the dining room is still there, just off of the kitchen. Presumably there’s still the nice big closet under the stairs. So the house still needs some upgrades — some sweat equity. It still has a lot of great features to love, like the floorplan, the good room sizes, the great location, the easy access to each room without being an open floor plan. Our lease isn’t up until January. We could buy the house, get it upgraded, and take our time moving in before November, when we hope to host Thanksgiving. And yeah, this house didn’t have room for everyone. We could fit maybe 8 people in that room. But Thanksgiving was unusual and we would probably have to fit people at two tables anyway. Some people would sit at the dining room table and some people would sit at the breakfast table. It was definitely workable. I worry about that yard though. Like I said earlier, the neighborhood is very hilly. The darling house sits near the top of a hill and has a fairly small slope. 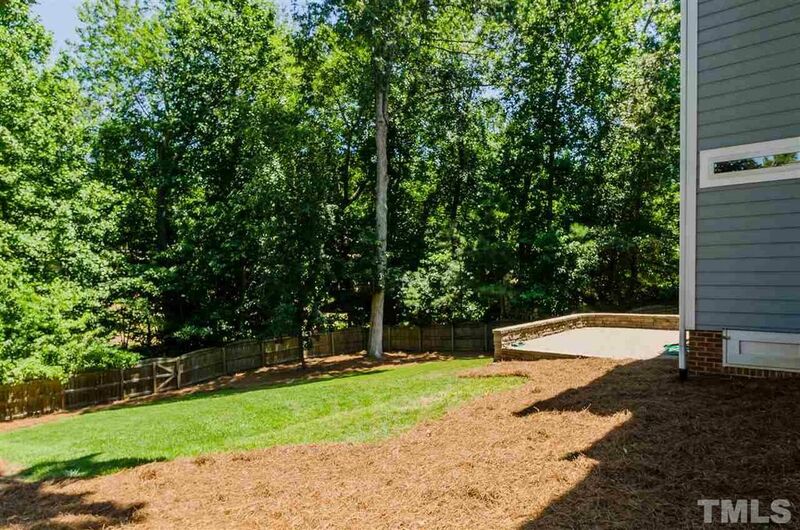 This house’s backyard has a steep slope. You can’t play croquet on a slope like that. Not the whole game at least. 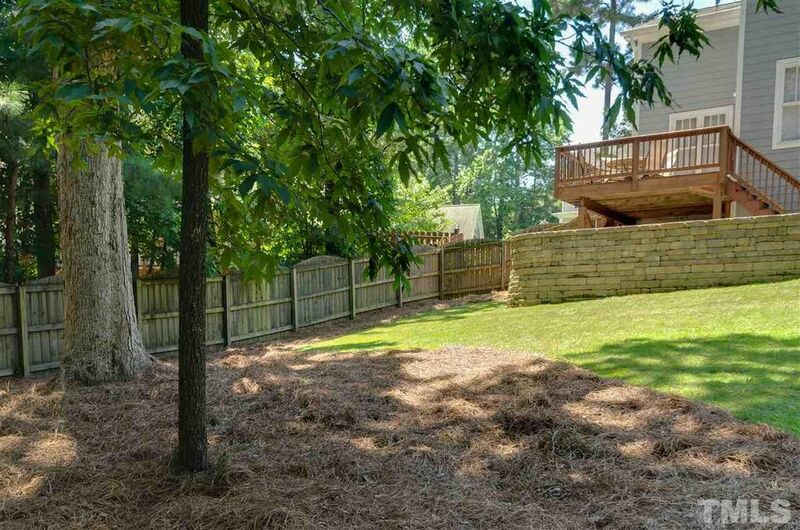 If we bought this house, we would have to do something to that backyard to even it out. Maybe add more retaining wall, turn it into stairs. I could play around with it. Draw up some diagrams. Hire a professional landscaper. And a professional contractor to upgrade that kitchen. 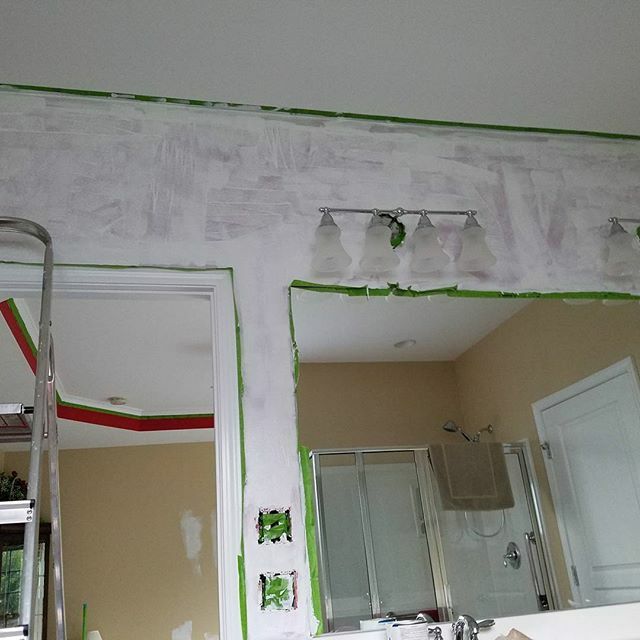 Maybe have that contractor build some built-ins for us. I feel like a lot of the little stuff we could do on our own. But those are expensive. There’s other houses out there. Houses with flat back yards. Houses with quartz or granite countertops. Houses with separate family and living rooms. Houses with screened-in porches. And I bet some of those houses are in Apex too. So James and I are looking to buy a house in the next few months; sell Deb’s house, buy a house for ourselves. Today we met with our real estate agent, Jenniffer, who is going to help us with both of those. We showed up right on time; I made sure to wear a professional-looking dress and did my makeup, to try to look respectable. James showed up jean shorts and a t-shirt, to show what sort of person he is. Our real estate agent is a mother of three, with a nice haircut. She was wearing a lovely sleeveless blouse with the ruffled collar. The first thing she did was sit down with us in the conference room and explain what exactly a commission is for, how it gets split up, and what exactly she is legally able to do. We explained that we had divvied up the responsibilities: since selling the house ties in so much with the will, James is the person to talk to about selling the house. Since I have no particular connection to the will beyond being married to James, I was in charge of buying the new house, just to take some of the pressure off of James. So James and Jenniffer talked about the legal deadlines about selling the house and how it would go on the market and all that. Then it was time to talk about the house we are going to buy. It was because of our work locations. Apex is halfway between Durham and Fuquay-Varina, and along the 55 corridor. Really, anywhere on the 55 corridor is good. “We’re looking for a starter house,” I said. “That’s where we met,” said James. She was amazed. “I lived in Reston,” she said. “We’ll be moving to the Richmond area, probably,” I said. “That’s getting to be a pretty expensive area,” said Jenniffer. “I’m the same,” James shrugged. We had never really thought about it. We didn’t have a strong preference, but a second-floor master bedroom made more sense. We explained that we wanted a second-floor laundry room but that it wasn’t a deal-breaker. We agreed that a second-floor laundry was very sensible. She pointed out that I had said something about a ranch-style house, James seemed to want more of a cookie-cutter house. I said that since I had grown up in DC, I had grown up surrounded by 50s-style ranch houses that were just adorable, which was the only reason I had said that. I also explained that I hadn’t grown up very rich. We were comfortable, but our houses had always been small and that was what I was used to. James, I explained, had grown up the only child of a corporate executive, and so had grown up in larger houses. “We want the formal area and the family area to be separated,” I said. “Separate entertaining spaces,” said Jenniffer. She mentioned that since we were planning on moving (“in about 5 or 7 years” said James), she would try to show us houses that were likely to sell again in a few years. We talked about working with contractors, to sell Deb’s house and possibly do work on our future house. I mentioned that since I have experience working with contractors at Home Depot, I felt comfortable around them. “Not as clients, but I’ve definitely worked with them,” I said. Jenniffer shook her head. “This is how it starts,” she said. “You do realize she’s a future real estate agent, don’t you?” she asked James. The next step was to drive to Deb’s house and take a look. 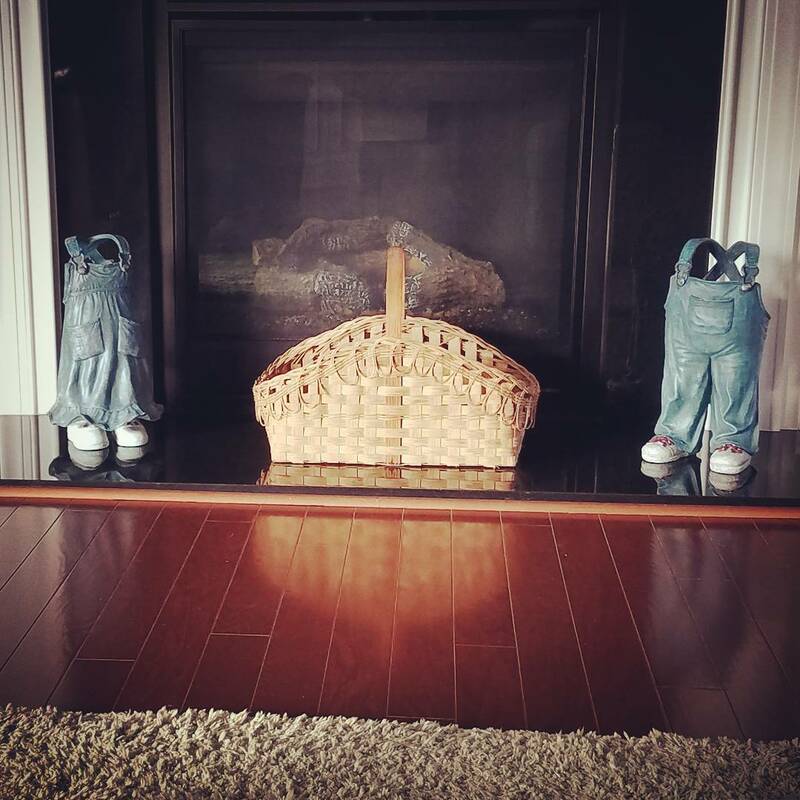 She took pictures and commented on different things that needed to be done to stage the house. The table in the breakfast nook was too dated. Get rid of the green sofa and green rug; replace it with the nice blue rug under the dining room table, and the blue sofa in the sunroom. Get rid of all the knick-knacks and the valuables; store them, sell them, whatever. “Those are easy to walk off with,” she told us. Fortunately I had done prior research and understood what she meant by “convey”: sell the appliances as part of the house. I showed her the master bedroom. Well I couldn’t argue with that. It was red. Bright red blinds, bright red area rugs, bright red chair, bright red accent wall, bright red headboard, bright red quilt. “She made the headboard too,” said James, who had just come from picking up the mail from the next-door neighbor. “We’ll have to take that down,” she said. “Okay,” said James, who had also always hated that headboard. I’m not joking about how creepy those headless children are. Deb thought they were cute. No one — no one — could convince her otherwise. Jenniffer was amazed at everything Deb could do and had done. Deb had traveled to Africa and lived in Taiwan. 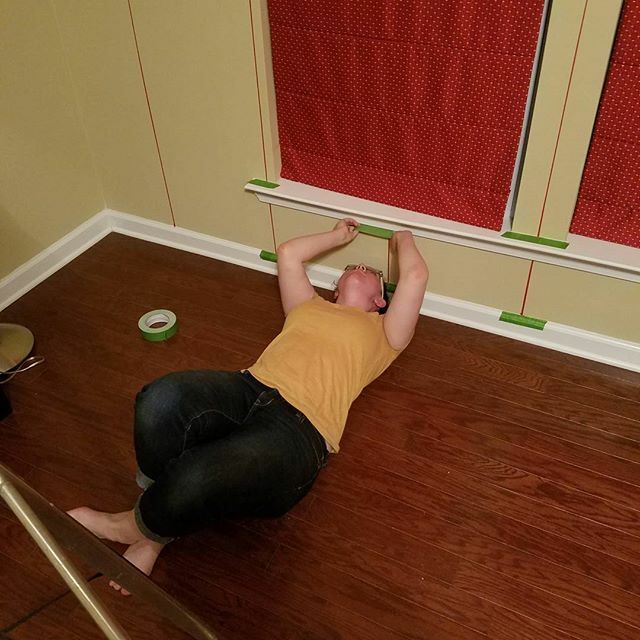 She was an amazing seamstress and had tastefully appointed her house (except for that red). The built-ins she had designed and had installed were amazing. The outside needed to be weeded and pressure-washed and the red needed to go away, but other than that, the house looked amazing. She left, and James and I started packing away all the various Hummels and creepy nutcrackers. We went out for pizza and then went home. James felt tired. I felt sad. We always do, after taking care of Deb’s house. When James picks up Cornelius’ two front legs and makes him dance, Cornelius feels as if he is a larger predator who is merely playing with him before being eaten. So as soon as James drops Cornelius’ legs, Cornelius runs away. James, for all his humanity, cannot communicate to Cornelius that he’s playing for the simple act of playing. And yet in the wild, cats don’t really meow past kittenhood. Yet Cornelius meows to us all the time, to say that he’s hungry, or to say that he’s annoyed, or to say that he’s hungry, or to say that he’s pleased that we’ve woken up so that we can feed him, or to say that he’s pleased that we’re home, because humans tend to feed Cornelius as soon as they come home. Feed him. He’s adorable. Feed the adorable kitty. Part of the reason humans are able to get across more complex ideas than “food now” is because our breathing and our swallowing tubes are connected. A simple flap covers our breathing tubes while we swallow. But humanity developed this eons ago. We slowly develop, from an early age, the instinct to hold our breath while we chew and swallow, so as to protect our basic breathing. Except me, apparently. In February 2015 Lacey and I went to celebrate our birthday at E Street Cinema’s Oscar Shorts marathon. As we headed out of town, we started making fun of President Obama. Lacey did a fantastic imitation of Obama’s stuttering, as I questioned his choice of flag-themed boxer shorts. She said something that make me laugh right as I swallowed some water, and then I nearly choked to death, and threw up twice all over my winter coat, and Lacey drove me straight to the hospital because I was going to die right there on our 28th birthday. As far as I’m aware that didn’t happen, although who knows? A month later James proposed and then a little after that I got a full-time job with a company I love working for. 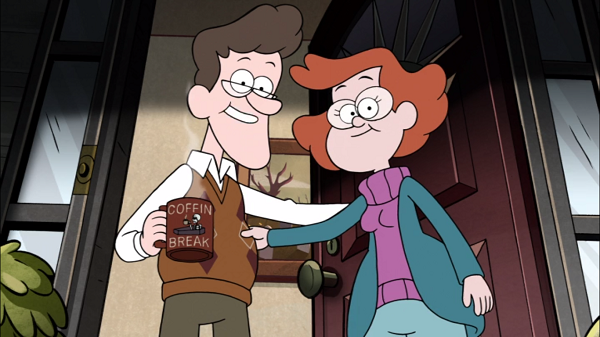 This morning I was watching Gravity Falls and drinking my usual morning coffee. 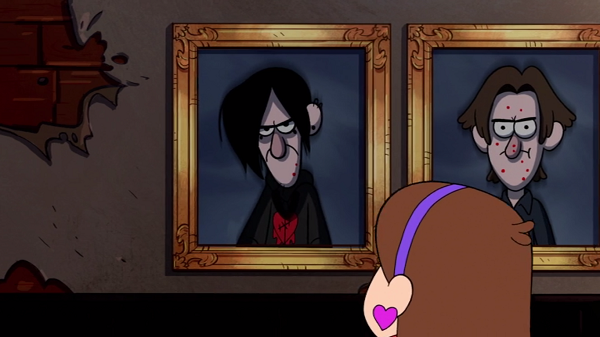 I’m on the episode The Love God, which is not the strongest episode but certainly has a really good opening. 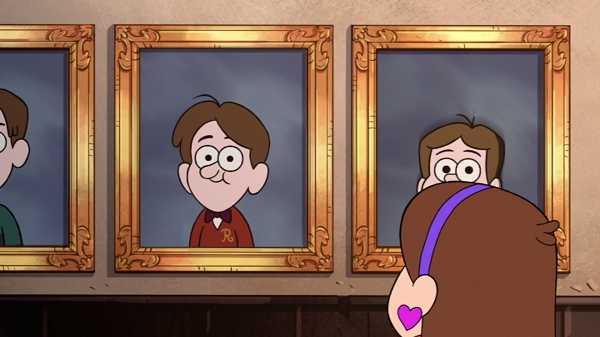 Mabel discovers that Wendy’s ex-boyfriend, Robbie, is not getting over the break-up very well, so she takes it upon herself to find him a new girlfriend. She visits his house and meets his parents, the world’s most cheerful funeral directors. 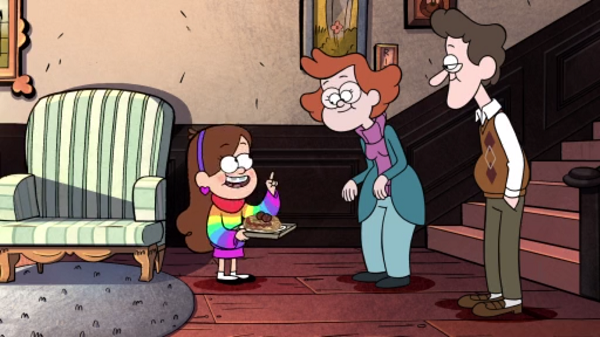 They ask Mabel to bring Robbie his lunch, a plate of spaghetti that uses the meatballs and the sauce to make a smiley face. “Lady, I like your style,” says Mabel. Then she goes upstairs. We are then treated to a montage of Robbie growing up. At that last picture, the overdramatic angst of 15-year-old Robbie combined with the random idea that what if Robbie and Mabel got married caused me to laugh right as I was taking a sip of coffee, and some water started going down the wrong pipe and, in a desperate attempt to not die, I threw up all over the carpet in our half-bath (and in the sink, but throwing up on the carpet sounds more dramatic and I will always go with the more dramatic-sounding option in the narrative of my life). Obviously I did not die, as far as I’m aware, but I’m kind of left feeling embarrassed. That’s twice in 18 months where I’ve nearly choked to death. Liquid keeps going down the wrong pipe. A basic human function is the ability to put liquid down one pipe and air down the other, and yet somehow I keep failing.